VITAMINS & MINERALS: Calcium and Vitamin D: Maxical? lead to low Calcium levels and subsequent weakening of bones. 1. 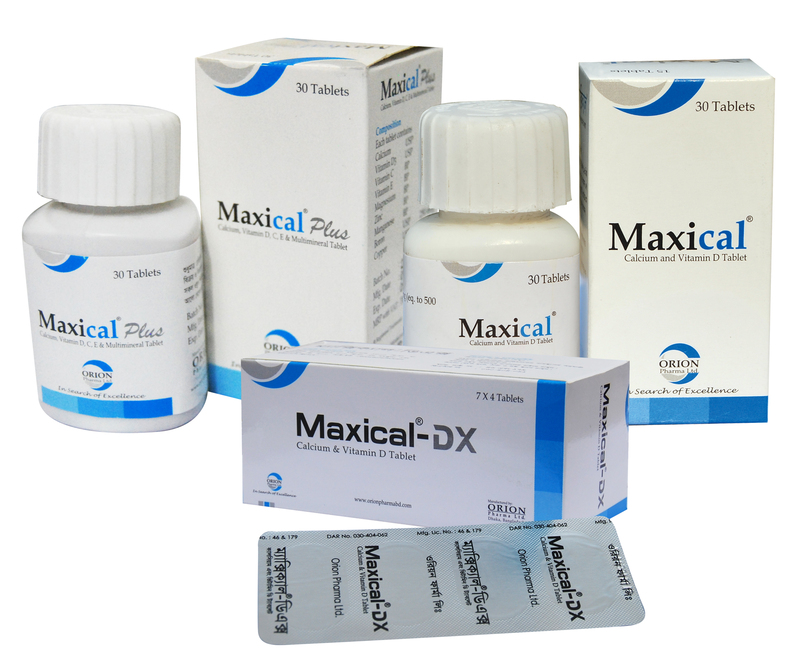 Treatment of osteoporosis, rickets, osteomalacia and tetany. 2. As supplement during pregnancy and lactation. 3. For prevention and treatment of Calcium and Vitamin D deficiency. Absolute contraindications are hypercalcaemia, primary hyperparathyroidism, kidney stone, severe renal failure, Calcium and Vitamin D overdosage, hypersensitivity to any of the tablet ingredients. Relative contraindications are osteoporosis due to prolonged immobilization, renal stones, and severe hypercalciuria. urinary calcium exceeds 7.5 mmol/24 hours. you should only use this medicine after consulting your doctor. Thiazide diuretics. Concomitant treatment with Phenytoin or Barbiturates can decrease the effect of Vitamin D because of metabolic activation. Concomitant use of Glucocorticoids can decrease the effect of Vitamin D. The effects of Digitalis and other Cardiac glycosides may be accentuated with the oral administration of Calcium combined with Vitamin D. Calcium salts may reduce the absorption of Thyroxin, Sodium fluoride, Quinolone or Tetracycline antibiotics or Iron. It is advisable to allow a minimum period of four hours taking the Calcium products. gastric pain, diarrhea. Following administration of Vitamin D supplements occasional skin rash has been reported. Hypercalciuria, and in rare cases hypercalcaemia have been seen with long-term treatment at high doses. should consist of stopping intake of the drug and rehydration. Plastic bottle contains 15 tablets and 30 tablets.